Fire chiefs say the number of incidents in which motorists hinder emergency service vehicles with erratic driving and poor parking is worse than ever before. These motorists are putting lives at risk by blocking off roads and even stopping on box junctions outside fire stations. However, it is not just parking that is the problem and firefighters say some drivers are not sure what to do when they hear the sirens blaring. Some people are pulling up outside stations to do the school run or cutting through the service’s Eastleigh headquarters to avoid traffic lights. Rushmoor Fire Station recently had several appliances blocked in when a coach parked outside bay doors so passengers could have a cigarette. On another occasion crews were obstructed when a motorist left his car outside the building while he went for a kebab. Assistant Chief Officer Andy Bowers said: “The issue of motorists blocking the paths of emergency services vehicles is worse than ever before. “On the road we have to deal with motorists who are unsure what to do to allow emergency vehicles to pass, and often slam on their brakes the minute they hear the siren, as well as people who try and tailgate when we have gone past. "Everyone should make sure that they know what to do for emergency vehicles, and ensure that their actions do not slow our vehicles down. The service is now giving guidance for motorists on how best to help emergency services get to incidents. CALM: Don’t panic or speed up in an attempt to get out of the way. Don't go through red lights or veer into a bus lane as you will still be prosecuted. Do not attempt to outrun a fire engine. You are not allowed to drive down the hard shoulder. You will still be breaking the law. In addition to these guidelines the public are urged to give a stationary emergency service vehicle a wide berth when moving around it. It is never acceptable to park on the grounds of a fire station without a legitimate reason. HFRS Academy Manager for Driving Lee Phillips said: “It is vital that people follow these safety messages which are reflected in the Highway Code. The Highway Code rule 219 states: “You should look and listen for ambulances, fire engines, police, doctors or other emergency vehicles using flashing blue, red or green lights and sirens or flashing headlights, or traffic officer and incident support vehicles using flashing amber lights. “When one approaches do not panic. Consider the route of such a vehicle and take appropriate action to let it pass, while complying with all traffic signs. “If necessary, pull to the side of the road and stop, but try to avoid stopping before the brow of a hill, a bend or narrow section of road. 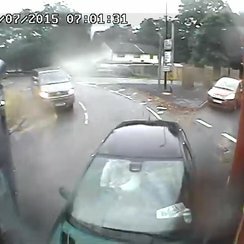 “Do not endanger yourself, other road users or pedestrians and avoid mounting the kerb.